John Battelle's Search Blog Is Our Republic Lost? Lessig, ever the lawyer at heart, presents his book as an argument, as well as a call to arms (more on that at the end). Early on he declares our country ruined, “poisoned” by an ineffective government, self-serving corporations, and an indifferent public. 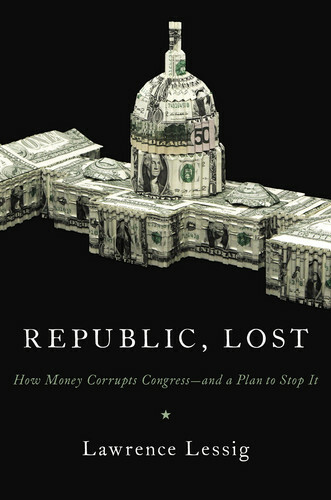 To be honest, it was hard to get through the first couple of chapters of Republic Lost without feeling like I was being lectured to on a subject I already acknowledged: Yes, we have a corrupt system, yes, lobbyists are in league with politicians to bend the law toward their client’s bottom lines, and yes, we should really do something about it. But Lessig does make a promise, and in the book he keeps it: To identify and detail the “root” of the problem, and offer a prescription (or four) to address it. And yes, that root is corruption, in particular the corruption of money, but Lessig takes pains to define a particular kind of corruption. Contrary to popular sentiment, Lessig argues, special interest money is not directly buying votes (after all, that is illegal). Instead, an intricate “gift economy” has developed in Washington, one that is carefully cultivated by all involved, and driven by the incessant need of politicians to raise money so as to insure re-election. Lessig calls this “dependency corruption” – politicians are dependent on major donors not only to be elected, but to live a lifestyle attendant with being a US Congressperson. Lessig also points out how more than half of our representatives end up as lobbyists after serving – at salaries two to ten times those of a typical Congressperson (he also points out that we grossly underpay our representatives, compared to how they’d be remunerated for their talents in the private sector). In short, Lessig says Washington DC is full of addicts, and if we’re to fix anything – health care, energy policy, education, social security, financial markets – we first have to address our politicians’ addiction to money, and our economic system’s enablement of that addiction. Because, as Lessig demonstrates in several chapters devoted to broken food and energy markets, broken schools, and broken financial systems, the problem isn’t that we can’t fix the problem. The problem, Lessig argues, is that we’re paying attention to the wrong problem. Lessig’s argument essentially concludes that we’ve created a system of government that rewards policy failure – the bigger the issue, the stronger the lobbyists on one or even both sides, forcing Congress into a position of moral hazard – it can insure the most donations if it threatens regulation one way or the other, this way collecting from both sides. Lessig salts his argument with example after example of how the system fails at real reform due to the “money dance” each congressperson must perform. Despite Lessig’s avowed liberal views (combined with his conservative, Reagan-era past), I could imagine that Republic Lost could as easily be embraced by Tea Party fanatics as by Occupy Wall Street organizers. He focuses chapters on how “so damn much money” defeats the ends of both the left and the right, for example. And at times the book reads like an indictment of the Obama administration – Lessig, like many of us, believed that Obama was truly going to change Washington, then watched aghast as the new administration executed the same political playbook as every other career politician. In the final section of his book, Lessig offers several plans to force fundamental campaign finance reform – the kind of reform that the majority of us seem to want, but that never seems to actually happen. Lessig acknowledges how unlikely it is that Congress would vote itself out of a system to which it is addicted, and offers some political gymnastics that have almost no chance of working (running a candidate for President who vetoes everything until campaign finance reform is passed, then promises to quit, for example). The plan that has gotten the most attention is the “Grant and Franklin Project” – a plan to finance all candidacies for Congressional office through public funds. He suggests that the first fifty dollars of any Federal tax revenue (per person per year) be retained to fund political campaigns, then allocated by each of us as a voucher of sorts. In addition, we’d all be able to commit another $100 of our own money to any candidate we choose. Uncommitted funds go to our parties (if we do not actively wish to use our voucher). Any candidate can tap these resources, but only if that candidate agrees to take only vouchers and $100 contributions (bye bye, corporate and PAC money). Lessig calculates the revenues of this plan would be well above the billions spent to elect politicians in our current system, and argues that the savings in terms of government pork would pay forward the investment many times over. Lessig ends his book with a call to action – asking us to become “rootstrikers,” to get involved in bringing about the Grant and Franklin Project, or something like it (he goes into detail on a Constitutional convention as a means to the end, for example). And it’s here where I begin to lose the thread. On the one hand, I’m deeply frustrated by the problem Lessig outlines (I wrote about it here On The Problem of Money, Politics, and SOPA), but I’m also suspicious of any new “group” that I need to join – I find “activist” organizations tend to tilt toward unsustainable rhetoric. I’m not an activist by nature, but then again, perhaps it’s not activism Lessig is asking for. Perhaps it’s simply active citizenship. I could see myself getting behind that. How about you? To get to that higher ground, to be able both to articulate a program the radical center and then to generate a mandate for it, we need to overcome or change the perverse political incentives that now keep such ideas and candidates promoting them on the fringe. How can we do that? Such a candidate would have the same impact as a philanthropist, improving the lives of other people after he or she is gone. Philanthropists’ bequests do change the world for the better, and an independent presidential candidacy can change America—and therefore the world—for the better as well. Of such a candidacy two things may be said with some confdence: First, it would not win the presidency. Second, over the long term it would probably have a greater impact on the course of American historythan the person who did. I don’t buy it. Mice. Cheese. Leaders. I think perhaps the people might surprise ourselves. Mmm cheese… still craving it, like Hope and Change. Sadly, these won’t pair well with whine this year. Imagine, a consensus of citizens who agree on a platform to serve constituent priorities. Remember that dairy parable—“Who Moved My Cheese”? I don’t buy it. That new “Fraklin Project” would generate another administrative branch, needing huge resources, so and so. Taxpayers’ would end just paying for the illusion of this “new and never-done-before” project. Read the book. Then dismiss it. I think “dependency corruption” is real and I enjoyed leaning from his book, “Remix.” This sounds like a good story guest for Stewart or Colbert. OMG! I just checked, Lawrence has been on both shows. How many authors can say that? Sweet! Previous Previous post: Thinking Out Loud About Voice Search: What’s the Business Model?